Our funds as at 31st December 2017 were £333m, compared with £319m in 2016. Total return on our investment portfolio in 2017 was 7%, compared with 12% in 2016. Charitable activities for the Central and City Church Funds* as at 31st December 2017 were £14.9m, compared with £7.1m in 2016. Central Fund grants made for work to tackle poverty and inequality in London totalled £8m in 2017, compared with £7.1m in 2016. We made 136 grants in 2016, compared with 121 in 2016. City Church Fund charitable activities (in relation to which the Trust’s Board has no control) for work as stipulated by the Church Commissioners totalled £5.7m - it was £4.8m in 2016. Gross Distributable Income for 2017 was £14.8m, compared with £13.8m in 2016. Comparing the lowest paid permanent member of staff to the highest paid, the ratio was 4:7:1 in 2017. In 2016 it was 4:8:1. Trust for London is an accredited London Living Wage employer and is a principal member of the Living Wage Foundation. 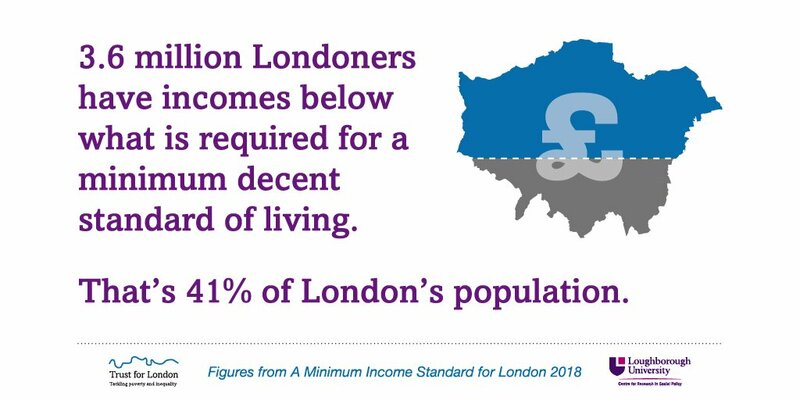 The London Living Wage from November 2017 is £10.20 per hour. *Grants payable were used for the Trust’s work to tackle poverty and inequality and for the work of the City Church Fund. The Trust has no involvement in how the City Church Fund is distributed.